Now that you closed a brand new deal to supply a social wifi network to a business, it's time to install the sleek SH100 in the business' premises. Below are the quick steps that you should follow when installing the MyWiFi SH100. Unpack your SH100 and connect the antennas. 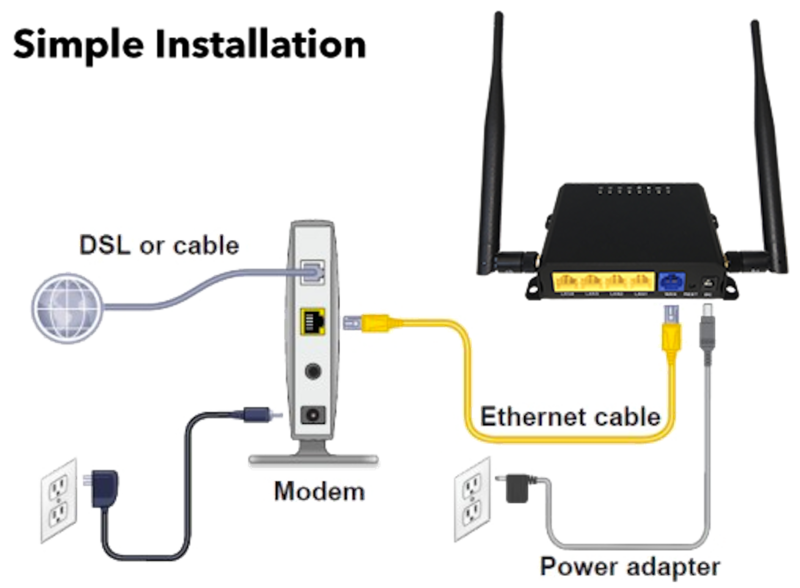 Connect an Ethernet cable to your existing modem or network into the BLUE port labeled "Internet/WAN" on the back of the new device. Then, plug in the power and wait for 2-3 minutes for your router to be fully calibrated with your dashboard. Be sure your device is properly calibrated and is communicating with the dashboard. That's it! Your SH100 Is Now Online! If your SH100 is not communicating with the platform, check our troubleshooting guide and if you have already done so, contact us by clicking the chat bubble icon in the lower right corner of the page.